Printing Facebook Gives A Whole New Meaning To The Term "Facebook Wall"
Ever thought to yourself: hey I would love to have all my Facebook friends’ profile pictures printed on one giant poster and decorate my living room wall with it? Yeah, me neither, but perhaps if you’d learn that you could do it, maybe you’d consider it. 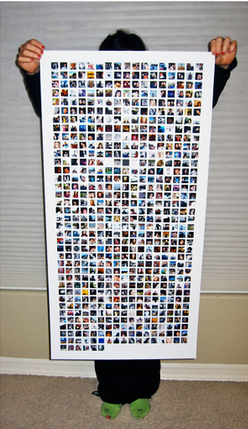 Enter Printing Facebook, which, well, lets you print all your Facebook friends’ profile picture on one giant poster for you to decorate that living room wall with. First of all, if you’re not in the contiguous United States, you’re out of luck as far as getting the poster shipped to you goes. If you are, and you have $25 burning in your pocket for something like this (including the shipping fee), you can head on over here to order your very own 20×40 real-life Facebook wall. All “Friends Posters” come printed in high-resolution on quality photo paper, wrapped in tissue paper and rolled in a cardboard tube. Artist Benjamin Lotan, who cooked up his “Friend Poster” thing just in time for the opening weekend of The Social Network, says this is only the first product in a series of many to come – in an email he says an option to print out your Tumblr blog will be out next. I really hope for his sake there’s an audience for that – I can somewhat imagine people willing to order print-outs of their Facebook social graph, but their blogs? Update: also check out OneMillionPeople, made by the guy who brought you the Million Dollar Homepage.